This is my second year as PYP Coordinator, and the first year I have tried my hand at instructional coaching. I completed an 8 week coaching course with Eduro and now I’m feeling ready to give it a try. So when a fabulous Grade 4 teacher at my school came to me looking for support, I thought this would be a great chance to put my learning about coaching into practice. First, we met and I listened to her concerns. Then I told her the premise of instructional coaching, specifically cognitive coaching, and asked if she would be interested in this kind of support. She said sure – let’s give it a try! So I blocked off an entire day to be able to be a fly on the wall and observe what was happening in her class. The first bell rang and I was ready to go. I had a pad of paper, a pencil, my coffee and an inquiring mind. I found a seat at the back of the class and simply asked my self “What do I notice?“. I jotted down everything and anything – judgement free, merely observations – and made note of the time for each observation. I also collected tallies for things like “on-task”, “engaged” “finished” “disruptions” to help collect some quantitative data that we could later analyze together. 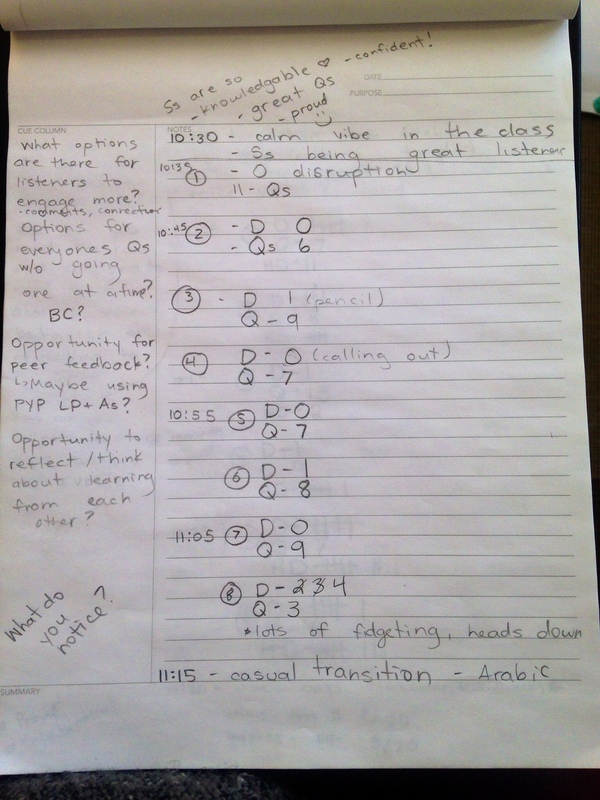 At the same time I recorded some ideas for reflective questions to guide my post-meeting conversation with the teacher. I loved that so many of the students were curious about what I was doing! It was a great opportunity for transparency and vulnerability – no secret teacher coach business! I told them I was like a learning detective and that my job was to make sure the most learning possible was happening in all of our classrooms. One of the ways I do that is by going into classrooms and seeing when learning is happening and when learning is not happening so that the teacher and I can meet and try to figure out why. They thought it was pretty cool and they especially liked my tallies and graphs about their learning. Once the day was finished, I sat down with the teacher and reminded her that our purpose was to pay attention to what was actually happening with the students, and to think deeply about why that might be happening. 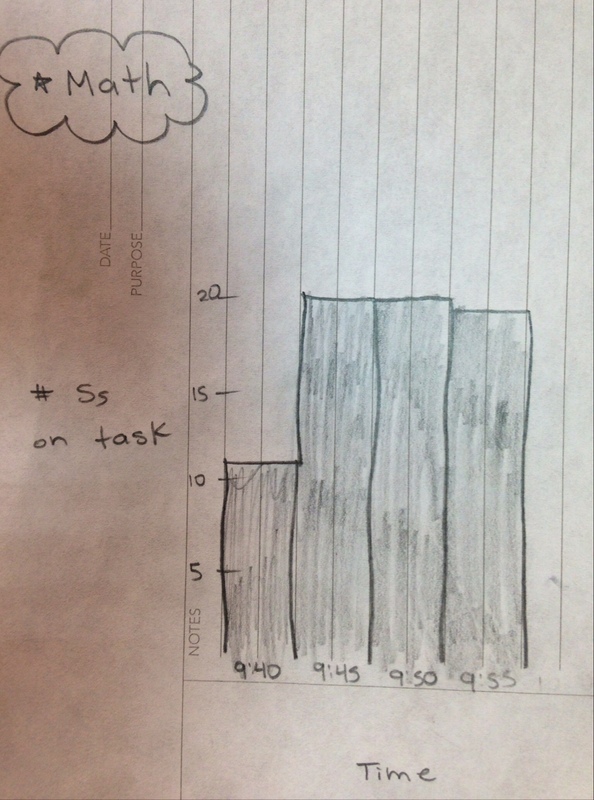 Next I asked her to compare the kind of day I witnessed to an average, typical day in her class. Was today an accurate representation of a typical day? Was today better than usual? Worse than usual? She said it was a much better than normal day. This gave me an insight into her thinking about what a “good day of school” looks and feels like. Her reflections – First, I wanted to give her a chance to reflect and share her perspective. How do you think (the start of the day, literacy, math, UOI, end of the day) went? Why do you think that was so? What do you think you did as the teacher to contribute to that? My anecdotal observations – Next, I offered to share the observations I recorded throughout that chunk of time by first asking, “do you want to know what I noticed?” Each time she said yes, so I shared my observations with her. I noticed you stood in the door way as they entered. I noticed you used a song for a transition. I noticed the students were able to self-manage that routine. I noticed there was lots of great conversation between partners. I noticed you wrote the steps on the board. Reflective questions – Then, I wanted to ask purposefully crafted questions to help her think deeply about her choices and her practice and how they impact student learning. What do you think the impact would be if you greeted each student at the door by name? What could be the benefit of a morning meeting? What is the value to the learner of having a peer mark their mad minutes? What could you do to allow for more students to share their thinking when you ask a question? What opportunities could there be for the students to engage in their peer’s presentations without interrupting? The data – After that, I wanted to share some quantitative data. 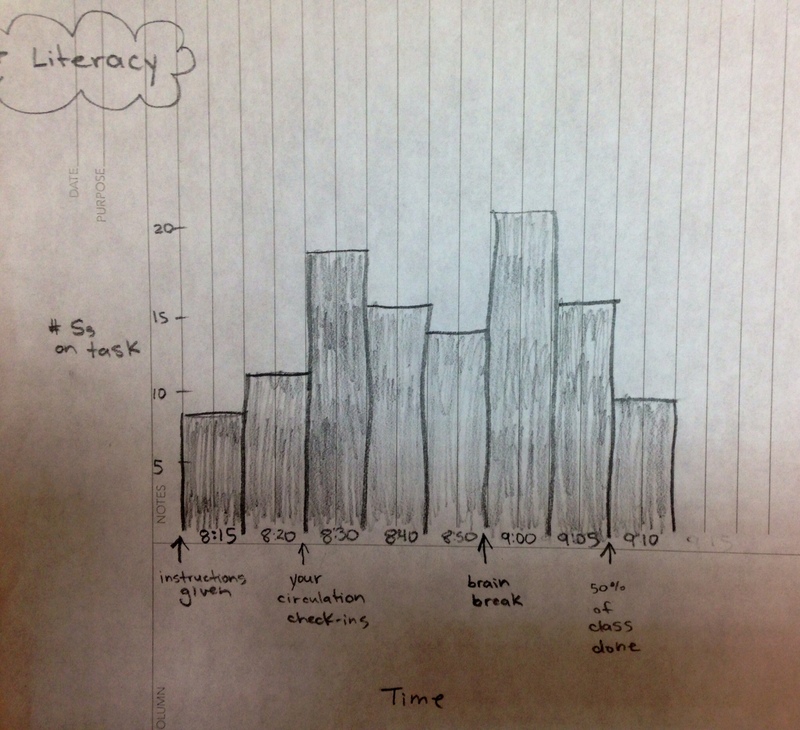 During the class time I took tallies of certain things, and during recess I turned those tallies into rough (okay, very rough) graphs to allow us to visually analyze trends. What do you notice? Why do you think that is? What does this reveal to us? What questions do you have? Next steps – Once we had gone through each chunk of the day, I asked her where she wanted to go from here. She decided that she wanted to take some time to continue to reflect on her own and go through her notes (that she was taking throughout our post-meeting). I respected that and told her that when she feels ready for the next step she can let me know and we can decide how best to proceed based on our discoveries and reflections from today. Since this was one of my first forays into instructional coaching I asked her to share some reflections with me about the process of instructional coaching – What was it like? What went well? What was helpful? What suggestions do you have to help me grow as a coach? Having you visit my classroom was a pleasant experience. (If you recall I was very nervous about it.) I felt exactly like you were a fly on the wall. I felt that the observations made were made to help me look at my classroom, students and myself. Things that were included were things that were done well and things to look at to see if I liked the result or wanted to change to try to improve whether it was student involvement or how the activity went. I did not feel like I was being told this is what you are doing wrong at any point. I liked the questions you asked. Some made me uncomfortable, but a good uncomfortable, reflecting more on how things went, if I like how they went and realizing I didn’t have the answer to some of them. I liked finding out that my expectations were not always correct. It was a very beneficial experience. I felt like the point was to help me reflect and change as I want to. I greatly appreciate the offer to help me continue my reflection and ways to improve and will totally take you up on it. Getting a chance to collaboratively reflect really helped me understand what she is interested in leaning more about and trying in her classroom. Since we met I have came across tons of resources that I know will be relevant to her learning, that I probably wouldn’t have known about without having the chance to sit down and chat with her one on one in such depth. All in all, it was a day well spent. I am confident… hopeful … confident that the work we did today will positively impact student learning in her classroom! I’d love to hear your thoughts and feedback about this process and any experience you have with instructional coaching. Please also feel free to share any constructive feedback about how I can improve as an instructional coach.